The Park-N-Page device is an automated SIP paging attendant designed to streamline call routing processes by notifying users or departments when a call is received. This fully embedded hardware uses PoE and provides scalability and centralized management. This device serves as an ideal solution for organizations that need to page employees across the facility when callers are waiting on hold. Automating call routing increases awareness across departments by broadcasting custom announcements to overhead systems. In addition, it removes the need for receptionists to manage incoming calls, reducing average call handling time (AHT) and ultimately improving customer service. Park-N-Page has proven most effective in industries such as retail, automotive dealerships, manufacturing, hospitality, and transportation. Park-N-Page automatically broadcasts announcements to overhead systems when recipients do not answer their phone. Recipients can access the system by picking up any phone on the network and dialing a prefix extension. This is an ideal solution for companies with employees who are not stationary, such as automotive dealerships or retail stores, and need to quickly connect a caller with a specific employee or department. 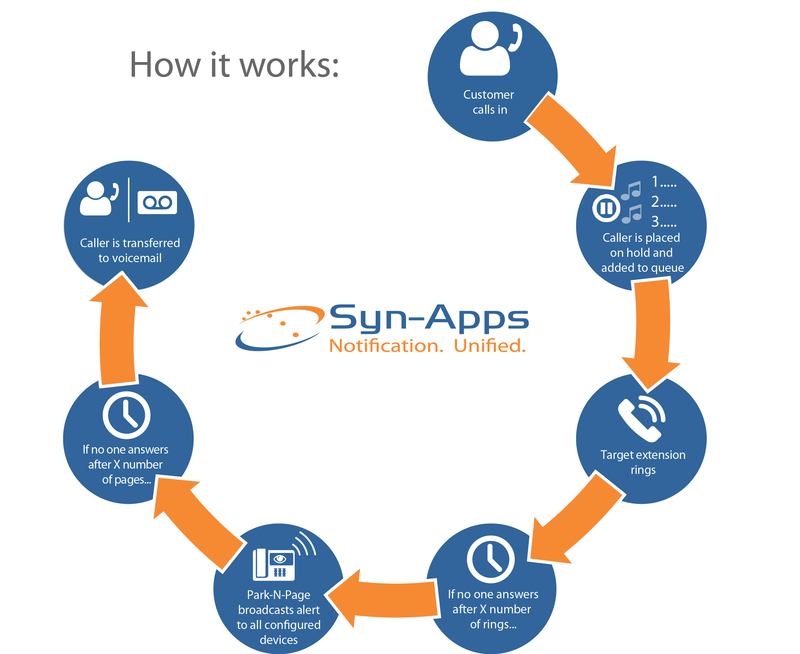 Incoming calls are "parked" and managed by the system in the order they are received. When the active call ends, the next call in line is answered. This helps manage high call volumes in a timely manner to ensure calls are not dropped or overlooked. Configure the Park-N-Page to suit your business needs with customizable parameters like number of announcements, duration callers wait on hold, and number of rings before being transferred to voicemail. Refer to the datasheet for details. If an organization experiences high call volumes and all lines are busy, instead of having the caller continue to wait for the next available representative, they are transferred to another extension or to voicemail. This helps improve customer satisfaction by handling calls as efficiently as possible. Stream music provided by your MoH source. As the Production Manager of a manufacturing plant, it’s your responsibility to make sure everything is running efficiently. Checking on floor production requires you to be away from your desk for the majority of the day, leaving you unable to hear when your desk phone rings. With Park-N-Page, when your extension is dialed, the caller is put on hold while your phone rings. If you’re unable to answer after a specified number of rings, Park-N-Page will broadcast an announcement through the store's overhead speakers, announcing there is a caller waiting on hold. If you’re able to take the call, you can pick up any phone on the network and dial a predefined extension to retrieve the call on hold. If you’re still unable to answer, Park-N-Page transfers the caller to your voicemail. Working in the bakery department of a grocery store, your department frequently experiences high call volumes from customers wanting to place orders. There are times when everyone is busy and unable to answer the phone. Incoming callers are routed to an IVR and prompted with a list of directory options. If a caller selects “Bakery” from the list, they’ll be routed to the Park-N-Page bakery extension and placed on hold. Multiple callers are placed in a queue and answered in the order they’re received. Park-N-Page can be configured to play promotional advertisements or music from your customized MoH source to keep callers engaged while waiting on hold. If Bakery employees do not answer, Park-N-Page broadcasts an announcement to overhead speakers that a caller is on hold for the Bakery. Employees can respond to the page and connect directly to the caller by dialing an extension from any phone on the network. If employees are still unable to answer the call, Park-N-Page will transfer the caller to voicemail.